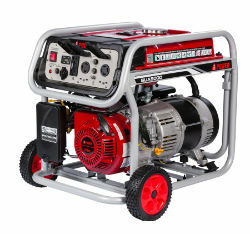 The A-iPower SUA5000 provides 5,000 watts of starting power and 4,250 watts of running power. Ideal for multiple uses at the job site, home, or recreational use. WHAT IT WILL POWER: Lights, TV, refrigerator, pump, and fan – all at the same time. Works with motor-driven power tools, which require greater surge watts.